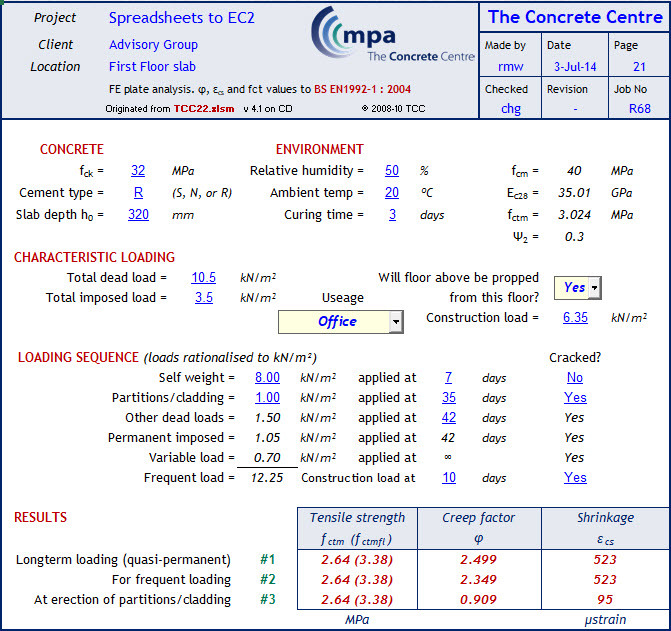 This spreadsheet provides values of creep factors, concrete tensile strengths and free shrinkage strains for use with finite element slab design programs that take account of concrete cracking (non-linear analysis). 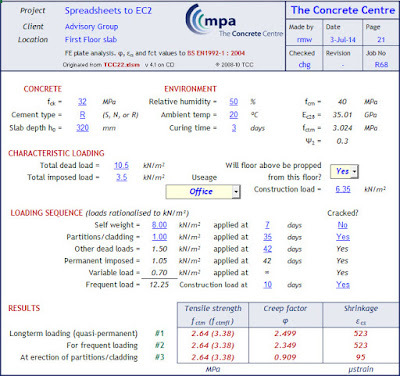 The methods used are those recommended in Concrete Society Technical Report No TR58. With programs that do not account for cracking, substantially higher creep factors should be employed, to allow for the increased displacements caused by cracking and shrinkage.If each stage is analysed with its' own φ factor and fctm, then ζ and fctm for the critical load case should be used at subsequent stages. If the calculation method employed does not do this, say NO at cell J14. For slabs with nominal or low restraint use fctmfl, and for severe restraint use fctm. An intermediate value may be used.